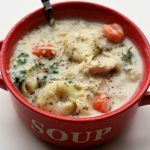 A creamy tortellini soup with chicken, vegetables and parmesan cheese. If you love chicken alfredo you’ll love this soup! Turn your Instant Pot to the saute setting. When the display says HOT add in the butter and swirl it around. Add in the onion and saute for about 4 minutes. Add in the garlic and saute for 30 seconds. Pour in the chicken broth. Add in the carrots, celery, salt, pepper and chicken. Turn off the saute setting. Cover the pot and secure the lid. Make sure valve is set to sealing. Set the manual/pressure cook button to 10 minutes for thawed chicken or 12 minutes for frozen chicken on high pressure. When the time is up let the pot sit for 5 minutes (display will read L0:05) and then move the valve to venting. Remove the chicken and place on a cutting board. Shred or cut the chicken into pieces. Add the chicken back into the pot. Warm the half and half (I just do this in the microwave for 1 minute). Whisk the flour a tablespoon at a time into the half and half until it is a smooth mixture. Pour the mixture into the Instant Pot. Turn the Instant Pot to the saute setting. The soup will thicken up fairly quickly. Stir in the tortellini. The frozen tortellini only take about 2 minutes to cook. Stir in the parmesan and kale. This recipe can easily be halved. Just halve all the ingredients and keep the cooking time the same.